Last weekend, fans of author Anne Rice's seminal Vampire Chronicles series jumped for joy when the author announced, via her Facebook page, that she had regained the live-action rights to her series of novels with the intention of creating an open ended television series based around them. Although one successful and (relatively) faithful adaptation of the first novel in the series, Interview with the Vampire, came out in 1994, everything afterwards has been a massive disappointment to fans. Warner Brothers made a pseudo-sequel to Interview in 2002 with Queen of the Damned, although with none of the original cast, resulting in a bastardized adaptation of the book that didn't please Rice or her fans. The movie tanked and readers have been waiting for a proper adaptation ever since. As recently as this year there was talk of a new film at Universal by director Josh Boone and writer Jill Killington, but ultimately the studio would pass and let the rights revert back to their creators. With Rice and her son Christopher now in control creatively of this potential series, fans finally have a reason to be optimistic. In an interview with Entertainment Weekly, Rice opened up about her overall hopes for the series. "We’re in the planning stage right now. Emails are flying back and forth with all our different ideas about how we want to do it." Rice said. She added "nothing is firm yet, except that we do want to start with the second book in the series, The Vampire Lestat. We want to start with him and his birth as a vampire and go on from there. And at this point, tentatively, I see two seasons, maybe, to do the entire book." This is especially good news for the fans, since the crucial second book in the series was skipped over the first time around. Rice also elaborated on why TV is the way to go on a book series as long and complex as The Vampire Chronicles versus movies, saying "TV is in a golden age right now. What’s being done in television is some of the greatest film art we’ve ever seen. Look what Game of Thrones has achieved. Look at Neil Jordan’s The Borgias. Look at The Crown on Netflix. I mean, the production values and the acting right now is just absolutely top quality in TV. And there’s much more room, I think, for innovation, originality, surprises, experimentation. It’s wide open right now. It couldn’t be a better time for any novelist to be adapting a book." Of course, what fans really want to know is who Rice plans on casting as her immortal heroes. While she doesn't have an actor yet in mind for Lestat, the series' central character, she does have an actor in mind for his immortal child, Louis de Pointe du Lac. "It’s Louis’ beauty that attracted Lestat to him, and I would hope it would be a beautiful actor like Matt Bomer. Somebody with that incredible beauty." Rice also has ideas on who she would like to see as Marius, the elder Roman vampire who is among the most ancient of the vampiric tribe. "I would absolutely love it if Matthew MacFadyen, the British actor, ever wanted to be part of this and wanted to play Marius. Marius is one of the pillars of the Chronicles – 2,000 years old – and I am an absolute, stoned fan of Matthew MacFadyen in Ripper Street and every other show that he’s ever done. Talk about quality TV — Ripper Street is just outstanding." 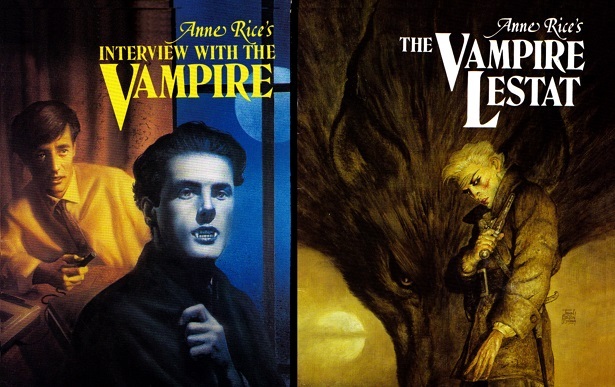 Who would you like to see play Lestat and the other vampires from Rice's novels? Let us know down below in the comments.